Wearing white can be super scary—we get it. But wearing all white, from head to toe, is even scarier. First, there's the possibility of spilling. Pro tip: Stay away from ketchup and any other easily spillable condiments to avoid any annoying fashion hiccups. Second, there's this age-old rule that suggests white cannot be worn after Labor Day—another reason rocking the colorless hue, well, slightly complicated when the seasons change. So, can you wear it or can't you? We say yes—white is a totally seasonless color, and we're all for sporting your bright whites in the heart of autumn because, to be honest, they're a breath of fresh air amid the sea of warm reds, oranges, and yellows that typically dominate our wardrobes. 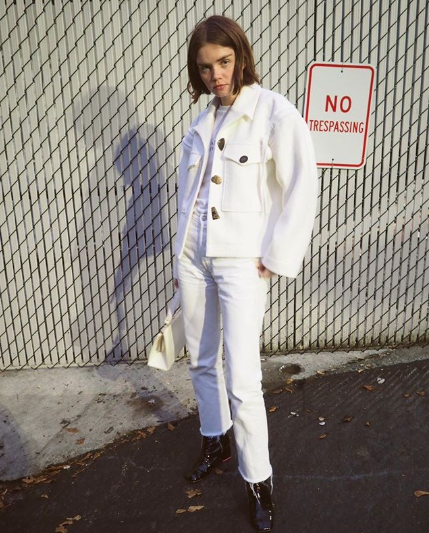 If you're looking for more proof that the color is definitely wearable come autumn, look no further than our roundup of the chicest all-white outfits for fall. The trick to sporting the hue, though? Pack away your lightweight white linen, lace, eyelet, and instead, opt for pieces rendered in heavier, more cold-weather-friendly fabrics like wool, cashmere, or denim. 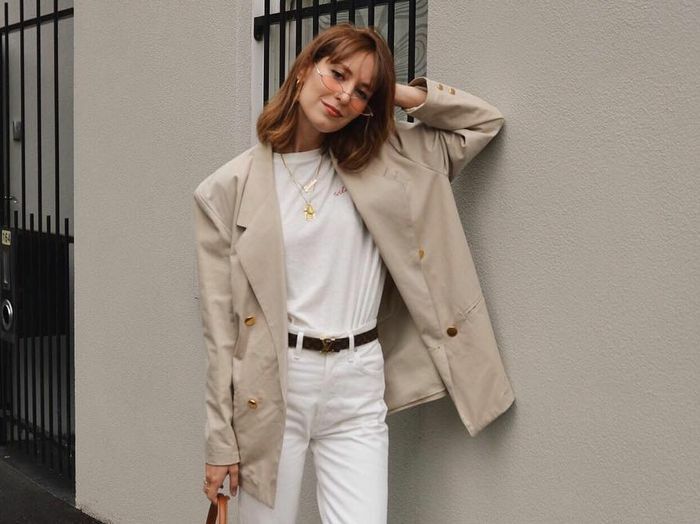 Of course, if you're not ready to part ways with your favorite summery LWD, you can still rock it in the early fall time—just be sure to bring some layering pieces when it gets chilly. Rock white denim from head to toe this fall. This is how you do an all-white look—from the accessories to the shoes. Layer up with a beige blazer. The perfect base to an all-white look. Your favorite summery LBD, but made for a chiller fall day with the pairing of sneakers. When it gets too cold, layer up with a leather jacket to make the look a bit more weather-appropriate. We'd wear a shirtdress any day. We're loving this sporty take on an all-white look. Another fall must-have? A cool windbreaker. White flares are a must-have for fall. Statement boots are even more, well, statement-making when worn with an all-white look. You can still wear your favorite summery blouse in the early start of the fall season. Then, once it gets too cold, layer a leather jacket over it. Pair these with all your favorite white tops. A super-chic all-white outfit for fall? A two-piece suit set to wear in (and out) of the office. We're loving the belted detailing on this jacket. We love a good statement tee. Who's ready for a trip to Paris? Contrast an all-white look with black accessories. You can never own too many white tees. White boots are a must-have for fall. We're head over heels for these boots. Transition your favorite lightweight blouse into fall by wearing it over a thicker turtleneck. Style this lightweight semi-sheer crêpe shirt with a white turtleneck underneath. How chic is this all-white look? And we love the pop of color through the addition of her accessories. These high-rise boyfriend jeans are so cool. You can't go wrong with a pair of white denim teamed with a cozy sweater. Hurry—this perfect fall sweater is nearly sold out. Next up, check out more monochrome ensembles we're copying for fall.